The What: The Hitachi PTZ Series is a line of full-HD cameras. The What Else: The PTZ Series is comprised of six models: the VZ-HD3600A; VZ-HD3650A; VZ-HD3700A; VZHD3780A; VZ-HD4000A; and VZ-HD4900A. All of the PTZ Series cameras feature an optical lens for Full HD with 10x zoom, while the VZ-HD4000A and VZ-HD4900A also have a 25x zoom. 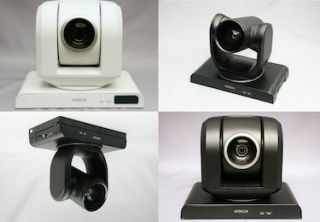 Four of the six models offer a wide horizontal viewing angle of 70 degrees, making them perfect for classroom recording. A direct drive motor pan/tilt mechanism provides non-distracting smooth and quiet functionality—a huge advantage in classrooms and videoconferences. The PTZ Series features a high signal-to-noise ratio and high resolution using noise reduction technology, while producing faithful color reproduction using a non-linear matrix circuit, and reducing false color signal phenomena. In addition, a full-HD, two-million-pixel CMOS imaging sensor offers bright colors and high sensitivity. The Bottom Line: The PTZ Series cameras support clear and lively video conferencing, video recording and net broadcasting, and are ideal for a variety of applications that include boardrooms, classrooms, auditoriums and houses of worship.